Playa Conchal has more than 5,000 yards of coastline accented by a rocky peninsula with steep topography. A white sandy beach approximately 2,500 yards long, offers magnificent views of the coastline. Playa Conchal is a unique stretch of beautiful beachfront made from a mixture of seashells and volcanic sand. Sprinkled with small trees, the beach area stretches in wide areas along the bay with possibilities of kayaking, wave runners, diving and sport fishing. 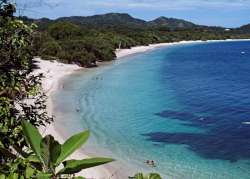 Playa Ocotal is located at only 40 kms from the City of Liberia and the gate to the Gulf of Papagayo. Playa Ocotal is a small beach protected by hills and cliffs of sedimentary metamorphic rocks of 80 million years of age. Its clear sands mix with scarce rock formations and the dry forests of the hills. Cirial Point to the West and La Flor Peak to the north provide for and outstanding view of scenic beauty - where the shimmering sands are dotted with mounds of rocks, the hills covered with tropical dry forest and the jagged coastline forever battered by the pounding surf. Ocotal is famous for its clear waters making Scuba diving and snorkeling an unforgettable experience.